The following are the prototypes for engines running on our layout. All models Märklin unless otherwise noted. Almost all prototype images at the European Railway Server. Folgende Modelle fahren auf unserer Anlage. Wenn nicht anderes gekennzeichnet, sind alle Modelle von Märklin. Fast alle Vorbildaufnahmen sind beim European Railway Server. 3029: Märklin fantasy tank engine, and a standard in the early start sets of the 60's. My first and still a favorite for sentimental reasons. BR 01: Fast express engine of the DB. BR 015: Fast express engine. This the 1960's Reko version of the Deutsche Reichsbahn (DDR). Models by Roco and Piko. To accompany these engines there are consists of prewar-style and modernisierungswagen in the Era IV cream/green livery. BR 02 201(18 201): The fastest (still) operational steam engine. Built by the Deutsche Reichsbahn (DDR) in 1959 out of parts of 61 002 which pulled the famed Henschel Wegmann train. Model by Roco. BR 10: Fast express engine, and the last ones built by the DB. Only 2 prototypes were made, of which only 10 001 survives at the Deutsches Dampflok Museum, DDM in Neuenmarkt-Wirsberg. BR 23: Passenger engine developed by the DB in the late 1940's, originally as a replacement for the aging BR38/P8. 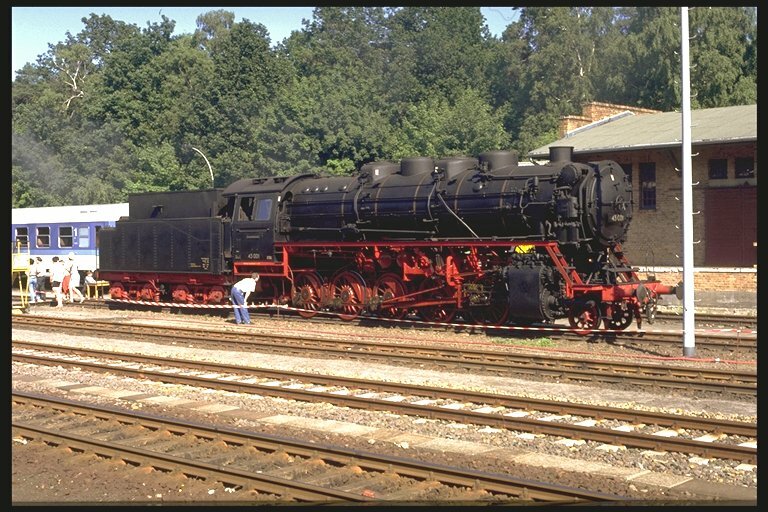 BR 24: Small mixed use engine developed in 1926 and used on branchlines..
BR 38: Formerly known as P8. Passenger engine of the DB. BR 41: DB fast freight also used in passenger service. BR 42.9: Experimental freight engine built in 1951 by the DB which featured Franco-Crosti boilers. These consisted of a standard boiler and one or two additional boiler for feedwater pre-heating to increase the efficiency of the locomotive. The stack at the front of the engine was used only for firing up the boiler, after which the exhaust gases were vented to the stacks at the sides of the boiler. BR 44: Heavy freight engine of the DB. BR 50: Medium duty freight engine that pulled everything from ore to passengers... Has a guard's compartment in the tender making use of a separate car unnecessary. Model represents the DB. Model by Roco. BR 58.3: Heavy freight engine of the DR and reconstructed from the Prussiaon G12. Model by Gützold. BR 65.10: New construction tank engine of the DR intended commuter traffic on suburban railways.. Model by Brawa. BR 74: Tank engine used for locals. Formerly known as the Prussian T12. Model represents the DB. 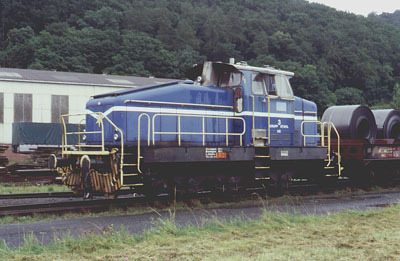 BR 78: Mixed use tank engine, the former Prussian T18. Model represents the DR.
BR 81: Tank engine used for shunting. Model represents the DB. BR 85: Heavy tank engine used for freight and passenger service on steep routes. Model represents the DB. BR 86: Mixed use tank engine. Model represents the DB. BR 89: Tank engine used for shunting. Only 10 ever built, but Märklin has sold over 5,000,000. Model represents the DR.
BR 94: Heavy shunting engine that also saw use in industries such as mining and steel. Model represents the GBAG mining consortium of the Ruhr. V60 / BR 360: DB shunter. V80: Precursor of the V100 / BR211. Smaller mixed use engine of the DB. Pulled everything. Model by Roco. V100 / BR 211: Smaller mixed use engine of the DB. Pulled everything. BR 118/228: DR equivalent to the DB's V160/B 215... Model by Piko. BR 114: Most powerful variant of the DR's class V100 engines. Pulled everything. Model by Roco. V160 / BR 216: Mixed use engine in its original dark red DB livery. V200 / BR 120: Heavy mixed use, mostly freight, Russian built engine used by the DR (East). Nicknamed the Taigatrommel (Taiga Drum) for it's loud noise. Model by Gützold. V200 / BR 220: This DB engine was originally designed for express trains, but ended its life pulling heavy freights. BR 233: Heavy mixed use, mostly freight, Russian built engine used by the DR (East) and in the unified DB. Nicknamed the Ludmilla. Models by Brawa and Roco. BR 323 / Köf II: Small DB engine used for shunting. Vossloh G2000: Diesel-hydraulic prototype/demonstrator locomotive G 2000, with open side gangways and very unusual asymmetric cabs. This four-axle locomotive is intended both for freight trains and for heavy shunting (radio-controlled). Model by Mehano. BR 101: Werbelok of the DBin the full CMA-Milch livery without red front/rear. This mixed use engine is most often seeing pulling Intercity trains. E03 / BR 103: The world's most beautiful express engine: powerful and fast. See other images of this beautiful engine at here. Models by Roco and Märklin. One can never have enough. Model represents the DB. E10 with crease (Bügelfalte) / BR 110: DB express engine developed in the 50's. In classic blue livery. Model by Roco. BR 111: Express engine developed by the in the 70's, but most often used on commuter and regional express trains. In classic old orange-white S-Bahn livery . E 19: Express engine developed in the 1930's. Livery is in the dark green of the late 40's early 50's. Model represents the DB. E41 / BR 141: Mixed use engine. Originally painted in the blue livery of express trains, it was later repainted dark green. Model represents the DB. E42 / BR 142: Mixed use electric developed by the DR in 1962. Model by Piko. E44 / BR 144: Developed in the 30's and used for freight and passenger service. Model represents the DB. E60 / BR 160: Shunter developed in 1927, which also saw service pulling locals. They were so reliable that they were modernised at the end of the 50's. Model represents the DB. BR 243 (Now BR 143): Mixed use engine developed by the DDR beginning 1984. Used frequently in local/commuter push-pull operation. BR 150: Heavy freight engine of the DB, in the original dark green livery. Model by Roco. BR 151: Heavy freight engine of the DB, in the original dark green livery. An updated version of the BR150. BR 184: The "Europalok" was a four-system mixed use engine developed by the DB in the late 1960's and used in the regions bordering France, Belgium, Luxembourg, and the Netherlands. DR VT18/BR 175: High-speed diesel railcar. The East German "TEE." Model by Kato. DR BR 772/772 / VT2.09: Diesel railcar developed by the DR, and nicknamed the "Ferkeltaxe" (Piglet taxi) because it carried just about everything on rural routes and "Blutblase" (Blood blister) because of its originally dark red color and the distinctive shape of the front. Model by Brawa. Model represents the post-reunification DB. VT 95 / BR 795/995 Schienenbus: DB diesel railcar, bus on tracks. Served numerous rural routes. SVT137: Fliegender Hamburger DMU. Built originally in the 1930's they for were for a long time the fastest trains on rails in Germany. Model is painted in the livery of DR (East). Model by Kato-Lemke. BR 515/815 EMU: DB battery powered electric railcar used on many branchlines. Schienenzeppelin: Propeller driven railcar using zeppelin based construction techniques. The speed world record holder until 1951. Never truly practical, it was scrapped a few years later. Schienen-Strassen-Bus: Road and rail bus developed for the DB for use on rural routes. The bus featured jacks which lifted it so the rail bogies could be removed. Powerd model by Brekina. Wismarer Schienenbus: Early diesel railcar from 1936. An example is still in use at the Eisenbahnmuseums Bochum- Dahlhausen. Also know as "Schweine-Schnäuzchen" (pig snouts) due to the hoods which extended beyond the cab at both ends.